Tim said “…..I’m very pleased with the performance of your wheel. I will order more wheels as I need them. Truly a quality product! Thank you! This wheel is a beast…..
One of the Best Suppliers I have ever worked with. Bill said “Good morning, Just a note to let you know Eagle Super Abrasives is one of the best suppliers I have ever worked with. Your employees are all great and you always have what I need. Thank you for helping us do what we do. For Grinding PCD (Polycrystalline Diamond) and PCBN (Polycrystalline Cubic Boron Nitride) a vitrified bond is typically specified by tool makers and re-sharpeners. The bond system incorporates sintered vitreous materials with carefully selected diamond / CBN powders and coatings to provide both a mechanical and chemical bonding of the abrasive particle to the bond structure, thereby resisting premature Diamond / CBN pull out. 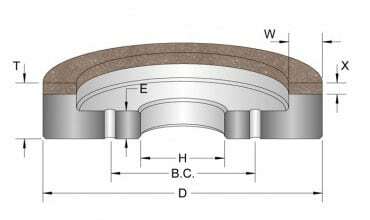 The wheel structure also incorporates induced porosity to aid with coolant delivery to the point of grind and to help the wheel to resist getting loaded up during use. Vitrified bond wheels offer tool life greater than 150 times that of a resin bond wheel and can be easily trued and dressed on the machine. Typical grit sizes for rough grinding are D22 Micron and for finish / Super finish grinding, typically a D9 – D6 micron grit size is selected. 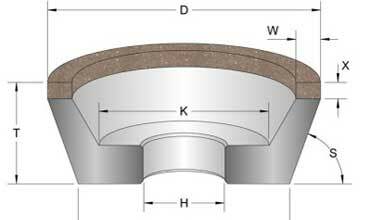 Wheel shapes are most commonly 6A2 and 11A2 Styles. These wheel core shapes are very rigid by design and are typically used on dedicated PDC / PCBN grinding machines such as Coborn, EWAG, Toyoda and Waida to name a few.